The HPA may also not habituate to repeated stress exposure. In this situation, the same stressor causes the same set of physiological functions as if it were a new, unique stressor. 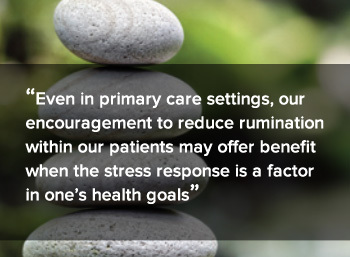 Repetitive and unwanted past-centered negative thinking, also known as rumination, is related with non-habituation of the HPA axis stress response.2 Even in primary care settings, our encouragement to reduce rumination within our patients may offer benefit when the stress response is a factor in one’s health goals. Ultimately, knitting together a patient’s story in regards to responses to new stressors, repeated stressors, immune function, and certain physiological measures are critical components to direct the methods in which we choose to support our patients under stress. 1. Schommer NC, Hellhammer DH, Kirschbaum C. Dissociation between reactivity of the hypothalamus-pituitary-adrenal axis and the sympathetic-adrenal-medullary system to repeated psychosocial stress. Psychosom Med. 2003 May-Jun;65(3):450-60. 2. Gianferante D, Thoma MV, Hanlin L, et al. Post-stress rumination predicts HPA axis responses to repeated acute stress. Psychoneuroendocrinology. 2014 Aug 1;49C:244-252. 3.Hellhammer DH, Wust S, Kudielka BM. Salivary cortisol as a biomarker in stress research. Psychoneuroendocrinology 2009; 34:163–171. 4.Kakimoto Y, Nakamura A, Tarui H, Nagasawa Y, Yagura S. Crew workload in JASDF C-1 transport flights: I. Change in heart rate and salivary cortisol. Aviat Space Environ Med. 1988 Jun;59(6):511-6. 5.Morse DR, Schacterle GR, Furst L, Zaydenberg M, Pollack RL. Oral digestion of a complex-carbohydrate cereal: effects of stress and relaxation on physiological and salivary measures. Am J Clin Nutr. 1989 Jan;49(1):97-105. 6.Jemmott JB, Magloire K. Academic stress, social support, and secretory immunoglobulin A. J Pers Soc Psychol. 1988 Nov;55(5):803-10. 7.Jemmott JB, Borysenko JZ, Borysenko M, et al. Academic stress, power motivation, and decrease in secretion rate of salivary secretory immunoglobulin A. Lancet. 1983 Jun 25;1(8339):1400-2. 8.Jasnoski ML, Kugler J. Relaxation, imagery, and neuroimmunomodulation. Ann N Y Acad Sci. 1987;496:722-30. 9. McClelland DC, Floor E, Davidson RJ, Saron C. Stressed power motivation, sympathetic activation, immune function, and illness. J Human Stress. 1980;6(2):11-9.